Post Caps protect your post tops from rotting but also add that finishing touch to your deck, fence or any outdoor space. Millworkcity offers a large selection of post caps a wide range of styles, colors, sizes and wood type. 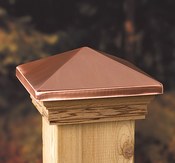 Select from wood pyramid caps, wood flat top caps, ball-top caps, copper caps, pyramid metal caps, flat top metal caps, finials, standard metal caps, Azek post caps. No matter the style or size, we offer the best prices on a wide selection of post tops! Fence and deck post caps by Nantucket Post Cap adds character and design interest to any outdoor space!